of any other product from the store. I have also noticed the trend of not getting sale prices unless you buy a featured item first, hope this isn't the new way as it will curb my spending big time. Some free things have always been part of the platinum perks. Now I believe they have at least one big plat freebie a month but that has been happening for several months now. The free with purchase products are often directly related to or add ons for the product that. Most of the time they are not even usable without the original product. That's not a "little" change. That's the single most effective thing DAZ could possibly do to discourage new users. I can say for certain that if the freebies hadn't actually been free two years ago, I wouldn't be spending far too much of my money on 3D content now. Another change you will see in the coming week is that our Weekly Freebies will now only be free with the purchase of another item - to everyone BUT Platinum Club Members. These Freebies will continue to be free to you without any additional purchases. NOT a change for the better. Glad I'm still a PC member. ...if "freebies" required a cash money purchase of another product when I started in this, I probably wouldn't have bothered with 3D at all. For months I existed pretty much on freebie content as I evaluated whether or not this was something I would like to continue to the point of sinking my hard earned money into it. This is not a good thing and I agree, a discouragement to newcomers. Im not really surprised either... sad to say. Of course what is interesting in The Freebies section is the fact that DAZ Studio 4.5 Pro has the scratched off price of $249.95. It is the only item in that section that does list an official retail amount. So, is it software for sale once more (soon) or a 'perk' of being a PC Member? IF I recall correctly, there was no price listed for a while beyond the $0.00, but I noticed this some few days ago. Then again, just one purchase grants you a freebie...if it remains there. Hexagon and Bryce didn't no matter that $19.95 is still peanuts for software. I've been keeping track of the Weekly Freebies since April 2012. 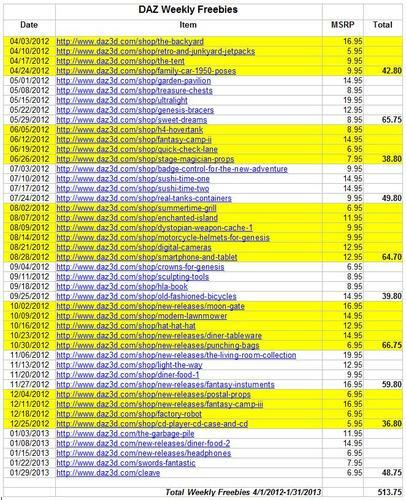 Considering they are regular store products, DAZ has given away $513.75 worth of content the past 10 months. I will be the first one to admit that I have been acquiring all of the weekly freebies since I've been keeping track, only because they are regular store items. Are there other sites that gives away regular store content for free? I can't say I'm honestly surprised to see this change, and it's clear it was done to promote spending rather than having people rely on handouts. Perhaps its a sign that times are tough and Daz is feeling the pinch just as much as the rest of us. To be fair, as illustrated above, they've given away hundreds of dollars worth of goods, to say nothing of the fact that some of their software products like Daz Studio are still being offered for free currently. As much as I love freebies, I respect that they need our money to survive as a business, and in these tough times some sacrifices need to be made. Making the freebies 'free' with an additional purchase is actually a pretty smart move in terms of psychology. It promotes sales while still offering items as a bonus. That it remains free to PC members also gently nudges more people towards platinum memberships, which in turn helps them turn a profit. I don't pretend to know the inner workings of Daz 3D's financial situation, but It's hard to imagine quite how they're sustaining themselves on the content sales alone. Especially with all the crazy sales they've had lately! DAZ3D weekly freebies very rarely require any other item to function. They can be complimentary to some other release but 99% of them are standalone things. Considering that PC members will get them without a need of purchase, I don't expect this to change. Kattey, If you had bothered to look at the time stamp before quoting me you would realize it was posted on the 31st. Well before the notice went out. At the time the only frequently occurring freebies that required a purchase had been add on products and mostly for PA products. I was not in fact referring to an announcement that had not yet been made to me. I wonder how it will be set up, really. Will it be 1 for 1? In other words, if I want to download Daz|Studio, I need to buy 1 thing. If I want to download the Autofit, i need to purchase another. Mill Cat LE? A third. Create Fiery Genesis? A fourth.. PFE? AniMate Sampler? I could see this getting messy fast :/ I was recently changing my Poser format files all over to DS format, simply because the program was accessible to anyone, and I remember when Daz was all about Tellware, tell your friends, bring out the artist in everyone.. I can't send over a new person now, and say "Check out the free versions, and the free stuff..get a handle on it, it's not too hard really.." and have them get hooked anymore. *sigh* Is Daz secretly under new management or something? With all the odd changes, the payment/website/design/CC problems, removal of galleries and now removal of true freebies, it almost feels like we're in the middle of a sloppy acquisition or something. Blah. Next Up, let's see if they start charging for the Genesis Essential's download instead of giving it away with DS. Why not? It's become a popular character in it's own right. I also look at it this way, of all the free items I have picked up over the years from DAZ, I cannot say I have used many of them at all. I dont think I have used even 5% of them. But if the item was not free, would I have bought it? I doubt it. So is DAZ gaining anything by me getting it for free? No. When they switch to the BOGO system for freebies will I buy something I dont want to get something for free i dont want? No. Does DAZ loose this way? No. I have lost nothing and they have lost nothing. Those who want the weekly freebie will buy the required item and that will be that. Given my budget lately, the weekly freebies and sharecg have been just about my only sources of 3D Models. The only item I have bought recently was 3DUniverse's Toon Cow, and I couldn't even use it until recently when it got updated! Like they say, All Things (good or bad) must come to an end! i said it before and I'll say it again... it's a very unfriendly change and will hurt sales in my opinion. A lot of people come just to see the freebies, and leave with things hey bought. But will not come to look if there are no freebies. Daz should focus on the broken PC club-- not letting people get charged when they aren't members, adding a PC renewal to the store so we don't have to OVERPAY to get a membership and then get a refund..... making coupons work properly, making GCs work properly, all those things are way more important. I am certainly not among the "top buyers" within the DAZ community, but I buy my share each month. I can say though that I likely wouldn't have bothered with DAZ Studio in the beginning, if there wouldn't have been the unrestricted free items. My first scenes consisted solely of free DAZ items. Since I didn't know about any other free item repositories (like ShareCG and 'rosity to name two of many places), I probably just would've moved on back then under the currently planned circumstances. In my view the free items did drag me in and once I got familiar with DAZ Studio and enjoyed it, I started to buy items - especially as the free items got certain limits (most are little gadgets / addons, partial scenes). Nowadays I use the occasional free item, especially when these are some everyday gadgets, like a CD player, but I won't buy just any item to get a free item in the future. Overall I won't spend more money at DAZ due to that. For new people this change is for the worse in my book. I cant afford to buy into the Platinum Club especially with the “activation” or whatever they want to call it charge of $29.95 in addition to the monthly or yearly fee. I used to be a member back when I had a decent paying job but now I cant afford to pay attention. I’m sure as hell not going to waste my money with a platinum club just to get a weekly freebie when I cant afford to buy to many products in a year anyways. Coming into here every week to see the new freebie and get it, whether or not I would even see me using the product soon didn’t matter since it was free and I could eventually find a use for it. In most cases I looked around for something to consider buying or even checked out the new releases. Not anymore. Granted I havent bought anything here in a long time due to lack of cash so the freebie really makes it worthwhile for us pissed on peasants in this economy. Sadly without the weekly freebie, I have no reason to come here at all after I get all my previous purchases downloaded and backed up on disc. I find this new site user unfriendly. Finding anything in the marketplace is a royal pain in the rear, the forums are hard to read with its blah white look and buggy email notification to replies that always go into my junk folders, I cant get my downloads by the date I bought them only alphabetically, my wish list is now about 50% full of content that is no longer available to buy because I never got any notification that warned me about them discontinuing them and I‘m considering switching to Poser 9 after using DAZ Studio for years just because Smith Micro Software hasn’t pissed me off yet. So yea, great plan guys. Take away the weekly freebie that goes to its regular price at the end of that week, just so you can scrape out some more cash out of any new platinum club members or forcing us to buy something we don’t really want or cant afford in the first place is not the way to go. I also got into using Daz 3d due to them offering freebies that encouraged me to give it a try. I don't buy a lot of stuff here but I'm not liking this new trend of theirs of only offering sale prices if you buy a particular item as most times I have absolutely no interest in the featured item being offered. ...actually, I found many to be useful. particularly the props and partial scene sets,all of which are by some very talented creators. There have been a few I actually did pass on as I don't do high fantasy or horror scenes, but even so, in the five years I have been here I would say I've easily accumulated well over 1,500$ worth of content when priced at full value. I wonder how this will affect participation in the Monthly Freebie challenges. @Ewokzombie (love the name) Concerning the PC situation, I have been wondering this myself as a lot of "long timers" have opted to let their memberships expire after the changes that went into effect and issues which arose when the new site went live. I can't fathom the people supporting the new mad scheme from Daz. Of COURSE Daz is in business to make money. Who here has EVER said otherwise? I like the freebies, but I certainly couldn't create entire scenes using just the freebies. I buy a lot of items in the store. For me, the freebies tend to fill out a scene. Most of the items I wouldn't personally buy (I'm a PC member, so this particular change doesn't really affect me). I check in regularly, in great part BECAUSE of the freebies. In fact, I check in at Daz more often than any other marketplace. Months can go buy before I check in at RDNA or many other fine marketplaces. Start charging for freebies and more people will leave. Not a platinum club member because there is nothing I want that would substantiate the cost. I only buy odds and ends, scenes mostly, and grab a freebie when it popped up. Now just one less reason to visit the site. If changing how freebies given away was supposed to encourage me to buy a Platinum Club membership, it didn't work. I am glad DAZ is running sales frequently. I've mentioned this change to the folks in charge of the monthly Freebie Challenges, and a reply should be forthcoming - I would expect to see it in the current Challenge thread. What has been announced (here) is that DAZ3D is sponsoring the Freebie Challenges again, awarding Gift Certificates (not coupons) for the top three entries. Not really sure how I feel about it yet...I'm just going to wait and see how it pans out. I spend a lot here I don't really care about the freebies mainly because after 7-8 years of buying 3d I have way too much. I'm more concerned about how the value items are going to be implemented. It could be done really well or really bad and at this point it's all speculation until we see how they put it into practice. DAZ removing the freebies doesn't really affect me as I'm still a pc member and even if I wasn't I tend to pick the freebies up only on the off chance that I may need them one day. There have been a few that I know I will never use and haven't put in the cart. I don't download freebies from other sites unless I see something that I would really like to have in my runtime. When I first started I downloaded freebies from everywhere some of which I've never installed. In regard to New Users, there are enough links in the Freepozitory that anyone just starting should find plenty to download and once they find ShareCG and rendo should have no problems finding free content. Would it be nice for them to get freebies here...*shrugs* its always nice to get something for free. Will it stop them from taking up 3D...I don't think so. Not if they're really interested and lets face it you get more free content initially with the starter kit then I got when I first downloaded DS I got V3, a fairy costume and a basic environment. So there is enough to get people started without downloading anything else. Do I think DAZ are doing this out of desperation? No...I think they picked up sufficient new users with Genesis to have kept solvent. Have they/or are they being acquired by a larger corporation...? Maybe...but unless it makes the news or is announced by DAZ how will we know? Just my random thoughts for what they're worth...and everyone here has a right to their opinion and their perspective on what's happening. agreed. I got freebies for about a year before I joined the PC(during that time I never spent a dime here because I didn't trust this place, got to admit the Daz brand isn't as well known as Subway Sandwiches or something). took me a long time to trust this company Daz 3d with my credit card information. Also I worried about the quality of product, just saying you have a 30 day money back guarantee means nothing. Anyone can say that. I didn't spend a dime till I thought that the freebies had proven the company well enough that I would risk signing up and forking over $30+$8 to be a PC member and start spending. http://www.daz3d.com/free-3d-models-and-content .... didn't used to have anything to do with being platinum perks and few are textures only. Times are a-changing. :-( Mind you it's only 20 items or so right now ... things like D/S4.5 and its plugins.